First Student urges motorists, students and parents to take extra precautions this winter to stay safe on the roads and at the bus stop. (PRLEAP.COM) CINCINNATI - While winter officially arrives on December 21, many areas of the country have already been experiencing snow and ice, which can mean dangerous driving conditions. First Student urges motorists, students and parents to take extra precautions this time of year to stay safe on the roads and at the bus stop. Even in winter weather, school buses are the safest way for children to get to and from school. First Student buses are twice as safe as the industry average. The company's drivers receive comprehensive training, including preparation for driving in adverse conditions. Every First Student bus also follows a strict vehicle maintenance program to ensure it is in top-operating condition. "The safety of children on the school bus depends not only on the bus driver, but other drivers as well," said Darryl Hill, senior vice president of safety at FirstGroup America, the parent company of First Student. "We ask everyone to join us in keeping students safe by being prepared for the travel challenges that can accompany the harsh winter months." 1. Time is on your side. Give yourself extra time when the weather is bad. Drivers who give themselves extra time to get to their destination help ensure a safe and appropriate speed for road conditions. 2. Watch for school buses. Passing a stopped school bus from behind as it loads or unloads children is illegal in all 50 states. It's estimated that more than 80,000 drivers break this law every school day, causing close calls and injuries to children. Everyone plays a role in ensuring students get to school safety, so please use caution and maintain a safe following distance. 3. Be prepared. Make sure the wiper blades, tires, battery and defroster are in good working condition before inclement weather hits. Keep the vehicle's gas tank full and check window washer fluid levels. 4. Remain alert. Pedestrians are more likely to be rushing during cold temperatures and could be hidden by poor visibility or snow banks. Remain alert for children who may be hidden or standing in or near the street at the bus stop due to mounds of plowed snow. 5. Drive for conditions. Adjust your driving behavior to the weather conditions. During winter, this often requires slowing down and increasing your following distance. Anticipate that bridges and overpasses may be icy and minimize acceleration and hard-braking. 1. Don't rush. When roads and sidewalks are slippery, rushing to catch the bus or driving faster to make it to your destination can have disastrous results. 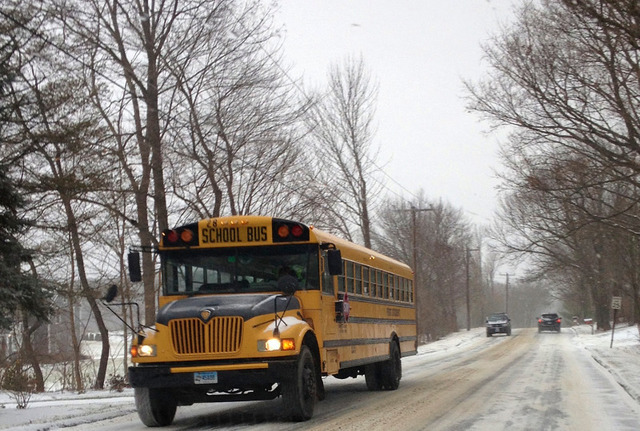 Children need extra time to get to the bus stop in cold, windy or snowy conditions. Encouraging them to leave a few minutes early and take their time can reduce the number of falls on slick pavement. 2. Bundle up. Students need to keep warm at the bus stop, but they also must still be able to see and hear what's going on around them. When bundling up your child in the morning, make sure he or she still has an adequate line of sight and can hear traffic and other noises. 3. Watch your step. When walking on snow covered or icy surfaces, watch where you are walking, take shorter, more deliberate steps or do the "penguin shuffle." 4. Get a grip. Wear footwear appropriate for conditions. Avoid footwear with slick (no-tread) soles when walking on wet surfaces, snow or ice. 5. Be patient. School bus drivers are trained to drive in inclement weather; however, snow and icy roads can slow down even the most experienced driver. Safety is each driver's top priority and extra time may be needed to get from stop to stop. 6. Hold on. The seemingly simple task of getting on and off the bus can be taken for granted. Always use the handrails! 7. Be weather aware. Bad weather can lead to school cancellations, delays or early dismissals. Make sure your school has your contact information to receive alerts, and be sure to check your school website or local media when inclement weather is expected.